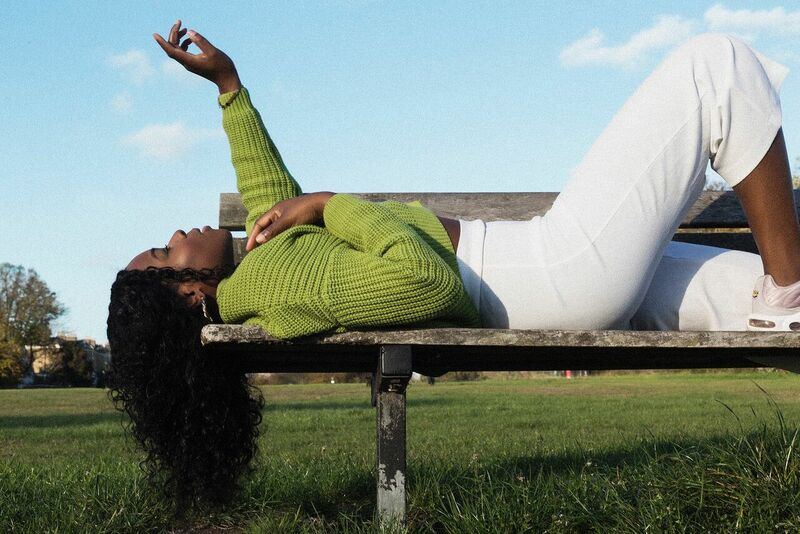 Though South-East Londoner Laolu has been writing songs since she was a child, poor mental health and the pressures she was placing on herself took their toll. The Nigerian-origin R&B artist has spent the past three years away from music. Thankfully, Laolu has come back from that time feeling rejuvenated and ready to explore her self-doubt. Her debut EP, All In Me, is out tomorrow (Friday 30 November), but is currently streaming exclusively on gal-dem, below. The nine-track release glimmers with the hallmarks of early 00s futuristic R&B, all while dealing lyrically with depression, interrogating just how easy it is to compare and despair with our peers when we’re in our 20s. To mark the release, we had a quick chat over email about self-care, sadness, and making remixes of Cleopatra songs back in primary school. gal-dem: Can you give us a little background on how you got started? Laolu: I started singing aged 10 – the first song I ever sang was ‘Oh Happy Day’ from Sister Act 2. I went on to study music at college and university, but I had started songwriting in primary school. My friend Bonnie and I used to take Cleopatra songs and remix them, then perform them during lunch. I started getting serious about music in secondary school – I knew it was what I wanted to do and I was determined to learn as much as possible. I get Kelela and Janet Jackson vibes from your sound – would you consider them to be influences at all? Which other artists have shaped you? I have had many people say that they’re reminded of Kelela recently with my music – I’ve only really listened to her briefly and I like her vibe. I grew up listening to Janet Jackson and I’ve always found that she was always in her own lane: She was never trying to imitate or be anything other than her authentic self, which I love. Brandy is a huge influence of mine, I grew up listening to Brandy non-stop – it was always her or Michael Jackson. Her music taught me how to build a song, how to place backing vocals and how to develop a song vocally. She is my favourite artist. You’ve been away from music the past three years – was there a particular moment which made you feel ready to come back? I had started a new job and was just getting my life back on track. I had been going to therapy to help with my depression and I remember I was home and mapping out what I wanted to do. I said to myself, ‘I know the best way to heal is through music’ – but I had been burned a lot by individuals in music and my confidence was out the window. It was a slow process at first, but I knew I had to beat depression and I wasn’t going to allow it to take music away from me completely. It was literally by force at first: forgetting all the negative thoughts, not giving energy to the fear or failing. I remember I had someone laugh at me when I told them I wanted do an EP but I didn’t allow that sway me. I was on a mission to write about my depression and my life and free myself of it all and come out on top. I called up the last producer I had worked with and said: ‘remember that song we started in 2016? Let’s revisit it – and oh by the way I want to make an EP.’ I contacted producer Duncsuei and did the same and that’s how it began. You talk very frankly about mental health and the pressures we place on ourselves in our 20s on this EP – was it important for you to be open with that conversation? This was so very important – the pressure we put on ourselves for not having everything sorted in our 20s really steals the joy of your 20s. We believe we should be living in a house, married, have kids or be super successful and making X amount of money – and really life doesn’t work like that for everyone. Everyone has their own path and I feel when we compare ourselves to others, especially with social media, it really can lead to feeling unworthy; feeling like a failure; and, unfortunately, lead to mental health issues. On ‘20’s’ I sing about everyday things we do like binge-watch Netflix shows or partying and then feeling guilty for doing so because there’s this unspoken rule that ‘NO! You are supposed to be working towards your goals and securing your dream career’ – and we forget you can do both. I really struggled with feeling like a failure and watching others around me grow and be successful whilst I was struggling with depression, cooped up in my house doing nothing. But I soon realised what you see of others is only a snippet – no one really shows the struggle or slow days and that’s fine… but then how can I compare my whole life to someone’s snippet? So I focused on myself and what I wanted to achieve. What would be your personal antidotes to those pressures? How do you practise self-care? If you do want to look to others, do so in a way to learn or be inspired. I’ve always believed in working and learning from those around you. I ensure that I put out into the universe what I want – positive affirmations. I always have in my mind my goal: every minute of the day, I am saying and thinking about what I want to achieve. It’s not always easy, but I have allowed myself to feel everything good, bad or sad and process those feelings so that they don’t engulf me or trigger my depression. It’s okay to have slow days, to feel like you aren’t doing enough, or you aren’t where you expected to be – but don’t dwell on those feelings because this is your own journey. I take days to myself to unwind my mental space: I listen to music, sing my favourite songs and visit friends and just be in the now, without worrying about what needs to be done, or about why this or that has happened. I want anyone who is battling with depression to see the journey that I have been on – I sing and write about all my experiences during depression, after depression, and then trying to find who I am again. I want people to have an understanding of who I am as an artist and a woman: I don’t sugarcoat anything I sing about, and I hope that makes it easier for people to relate. I hope my EP can show others that – even though mentally I was struggling with negativity, doubts and lack of self-confidence – something forcibly started out to overcome depression can lead to a breakthrough and bring back the joys of your passions and life itself.